More than twenty years ago, filmmakers Robert Rodriguez and Quentin Tarantino spun the vampire genre on its head with From Dusk Till Dawn. In that time, the film has only grown in popularity, having been reimagined as a TV series produced by Rodriguez. It’s not hard to see why it was so successful, though. The movie had a great script, a great director, and an excellent cast including George Clooney, Juliette Lewis, Harvey Keitel, Salma Hayek, and Danny Trejo. Not to mention a surprisingly chilling performance from Tarantino himself. 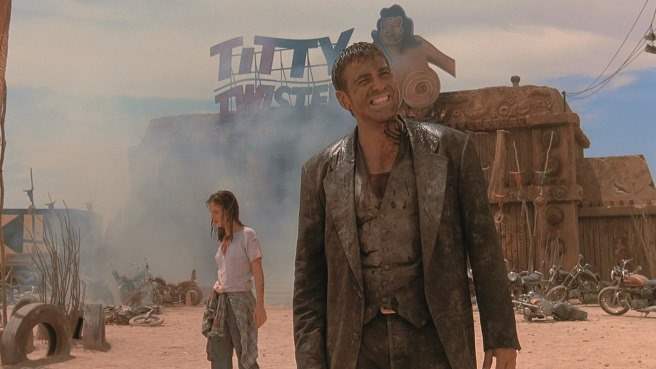 The thing that’s always most impressed me about From Dusk Till Dawn compared to other vampire movies is the fact that for the first hour, it’s not a vampire movie. It’s not even horror for that first half. It’s just a very straightforward, Rodriguez and Tarantino-esque crime drama. The film is simply about two brothers trying to get to Mexico and the trouble they get into along the way. Then, halfway through, there’s a complete and total shift in tone, but it works because you’re already so invested in these characters. It’s almost impossible to pull off, but they make it seem somehow easy. Because the Gecko brothers, the family they’ve kidnapped, none of these people were expecting vampires to come along and ruin their day, either. More than that, one of the most brilliant things about From Dusk Till Dawn is that the bar is the safe haven they’re trying to reach. If gives you a sort of typical crime movie plot saying, “Okay, look, if we can do these things without getting caught, if we can get across the border, then we will get to the bar and everything will be fine.” There’s exposition that almost says exactly that, so that when they do reach the bar and have those few quiet minutes you actually feel a sense of relief. It’s set up in such a way that it makes you feel safe, because everything we’ve been taught from movies is that once you reach the destination, the threat is over. 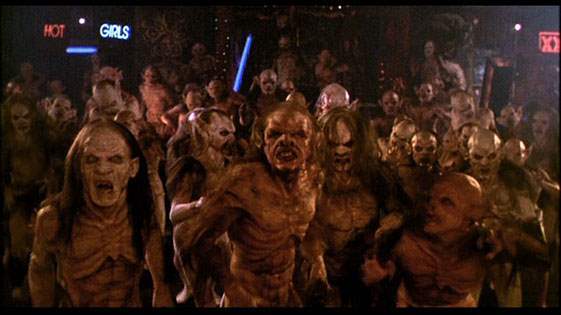 Of course, in From Dusk Till Dawn, once they reach the bar, that’s when the horror starts. It’s a simple concept when you think about it, but it works really well. Just about everything in this film is trying to be unconventional. Not only is it not structured like your typical horror movie, but these aren’t your typical vampires, either. The KNB crew did an amazing job creating all sorts of weird and memorable creatures, each one different from the last. While most vampire films adhere to the same general Eastern European/Germanic mythology, Rodriguez remains very true to form and makes a big change by basing his vampires off of Mexican and Central American folklore. There are some deviations from that, of course, but by and large these are Aztec vampires—just as the temple at the end of the movie reveals. Every time you think it’s going to turn left, From Dusk Till Dawn goes right and that’s just what makes it the cult classic it has become in the last two decades. One of the things that makes this style and tonal transition so easy to pull off is that the element of horror is there the whole time, it just doesn’t manifest itself in the form of vampires until halfway through. Even though the first act is very much an action/thriller, there’s a strong element of psychological horror in the form of Richie Gecko, played by Quentin Tarantino. Most of the time, when Tarantino shows up in his own material, his acting is less than stellar. Luckily, From Dusk Till Dawn is a perfect exception. It helps, of course, that this character is supposed to be flat and unresponsive to most things, because Richie is a violent psychopath. When he goes off the hinges, Tarantino’s natural, much angrier persona shines. One of the scariest moments in the film comes long before they even reach the bar, with Richie being left to keep an eye on the motel maid they’ve taken hostage when Seth goes out. He comes back, finds Richie sitting calmly on the bed—alone. There’s nothing nearly as explicit here as the violence we find later on in the movie. The horror here is accomplished through editing and cinematography. This subtle horror is very different from what we get later on, but crucial in setting everything up. Now, the fear doesn’t come out of nowhere. The vampires are an easier sell when we’ve seen moments of horror before them, and we reach that big reveal thinking that the only thing we have to worry about is Richie. In the hands of lesser filmmakers, From Dusk Till Dawn would be an absolute tonal mess. It required the perfect blend of action, horror and humor to pull it off with even the smallest bit of success. On paper, it’s not a movie that should work. But Rodriguez, Tarantino, the cast, the KNB crew, all the way down the line, they knew exactly what they were making. They all shared in that vision. And that, above all, is why we’re still talking about this film more than 20 years later.